Succulent baked halibut with a touch of lemon, Dijon mustard and dill is an ideal meal when something light and healthy is what you’re hungry for, and it’s ready to serve in around twenty minutes! Halibut was one of favorite kinds of fish to prepare and serve to my clients during my personal chef days. The light and succulent fillets were the perfect canvas to take on the slightly bright and tangy flavors of lemon, garlic, perhaps a touch of mustard, and a sprinkling of herbs and seasoning. And the fact that they baked off so quickly made it an incredibly quick and convenient meal to prepare! Because halibut takes on added flavors so well, it only needs a few minutes of quick marination before simply being placed onto a parchment-lined baking sheet and baked for roughly 12 minutes. 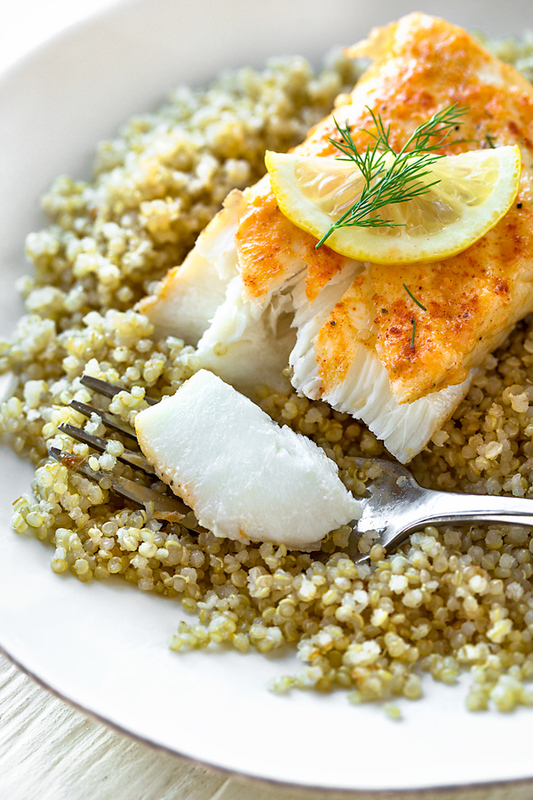 Baking halibut in this way yields a moist, flavorful piece of fish, one perfect to serve with a light accompaniment of simple quinoa, or some roasted potatoes, sauteed asparagus, roasted vegetables, or even a green salad. 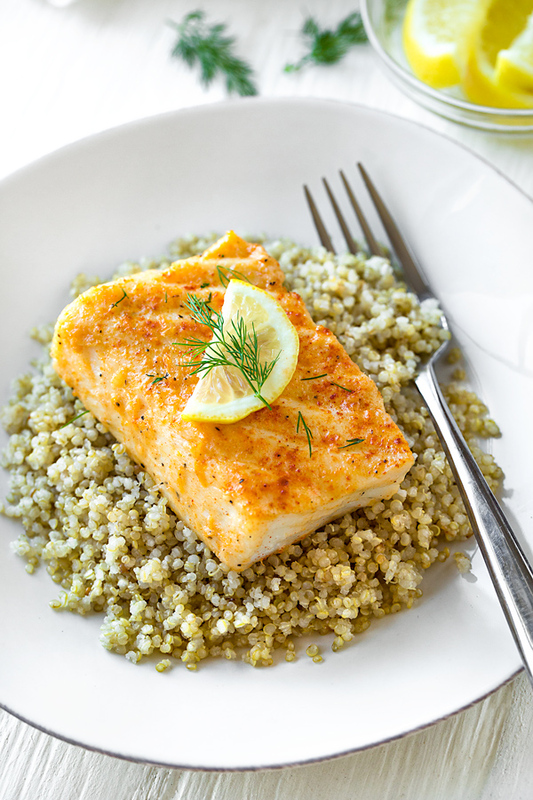 And if being easy to prepare and tasting so good wasn’t enough, it’s nice to know too that baked halibut is an excellent source of protein and omega-3 fatty acids. For me, of all the halibut recipes, baking it is a favorite way to cook it because it ends up so tender, moist and full of flavor. The key to cooking flavorful halibut is to be liberal with the seasonings, and choose complimentary flavor profiles. The delicious seasonings will then penetrate into the halibut and create a moist and delicious result. Depending on the thickness of your fillet, you can allow the halibut to sit in the seasoning in order to marinate for a few minutes (15-20 works really great), or just skip the marination and go straight to the baking. I prepare a quick paste with some Dijon mustard, some garlic, lemon zest and juice, plus some spices, salt and pepper; then, I brush this mixture onto my halibut fillets. If I have a few extra minutes, I allow the fish to marinate; otherwise, I preheat the oven to 450°, line a baking sheet with parchment or foil, and place the fillets on the baking sheet. The halibut is baked for about 10 minutes, then I turn on the broiler for a couple of extra minutes for a hint of extra color on top. I garnish the fish with fresh herbs (I love dill for this) and lemon, and serve! Choose, firm, fresh fillets: When you choose your halibut fillets, opt for firmer fillets that have a fresh, ocean-like scent. Also, run your fingers over the fillets to check for any tiny little bones, and remove those before seasoning and baking. Marinate for extra flavor: While you truly don’t need to set aside a lot of extra time for marination, even 10-20 minutes will allow the flavors of the seasoning to penetrate and create a more succulent result. Herbs of your choice: One of my favorite flavor combinations when it comes to fish is dill and lemon; so I like to finish things with a flourish of fresh chopped dill along with lemon slices. You can also use green onion, parsley, chives, rosemary or thyme, a small amount of oregano, or even basil. How long to bake: I find that roughly 10 minutes at a 450° temp is a pretty good ball-park for a 6 ounce fillet. You want to look for the fillets to be opaque in the center and still moist, with a tender “flake” to them, very slightly firm in the center when pressed. Then a quick finish under the broiler for 2-3 minutes adds a little extra golden color. 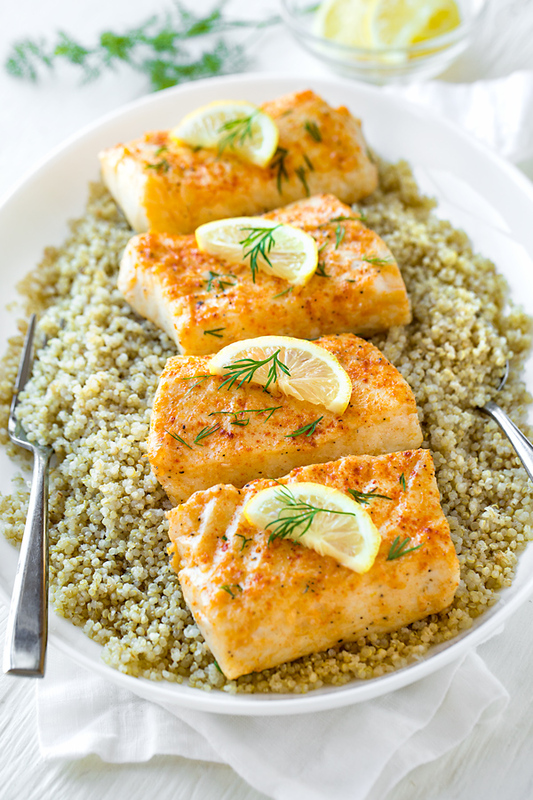 Succulent and flavorful, this delicious baked halibut is seasoned with lemon, garlic, Dijon and dill—it’s the main attraction in the perfect healthy meal! 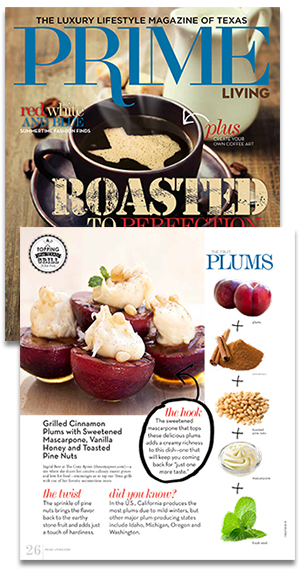 -Preheat your oven to 450°, and line a baking sheet with parchment paper or foil. -In a small ramekin, prepare the marinade/seasoning by combining the pressed garlic cloves, Dijon, lemon juice and zest, the paprika, and a couple of good pinches of salt and pepper with a fork; add in the olive oil, 1 tablespoon at a time, and blend that in until combined. 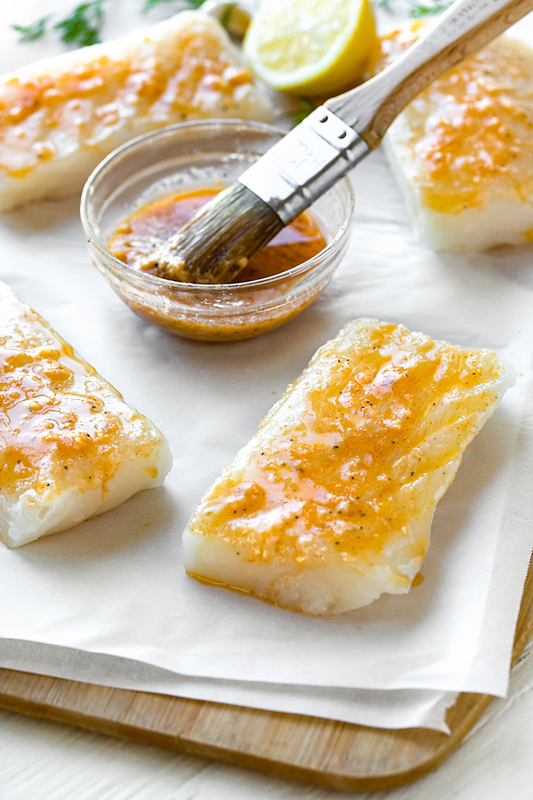 -Place the halibut fillets onto the prepared baking sheet, and brush each fillet with the seasoning mixture (or pour it directly over), and if you have a few minutes, allow it the fillets to marinate for 10-20 minutes. -To finish, sprinkle over some fresh dill, add lemon slices or wedges, and serve with your choice of side. 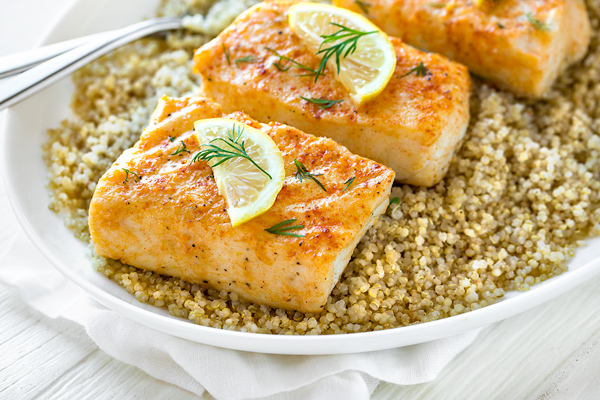 Hungry for more healthy fish or seafood recipes? Check out this Broiled Salmon, this Pan-Seared Salmon, this Grilled Salmon Chopped Salad, or this Cajun Shrimp Pasta! 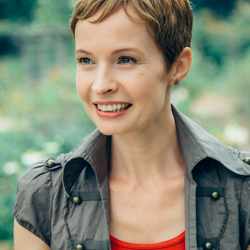 Ingrid – This recipe could not have come along at a better time. Fits perfectly into my new year Mediterranean diet. This will definitely be on the menu at my house this week! Hi Ann, good for you for going for the healthier food this new year! Hope you enjoy the recipe! Hey Vance, happy to read that! I love all of your recipes. I have a section on Pinterest just for the Cozy Apron. I often find myself turning to your recipes for things to cook. Your writing and photos are wonderful. You can almost taste the food. Thank you so much. Diane, that is such a wonderful thing to say. Thank you so much! I bought some beautiful cod that looks as thick as the halibut… can I substitute the cod?? Hi Annette, absolutely! Cod is another “meatier” white fish, nice and neutral in flavor, and would be delicious with these seasoning ingredients! 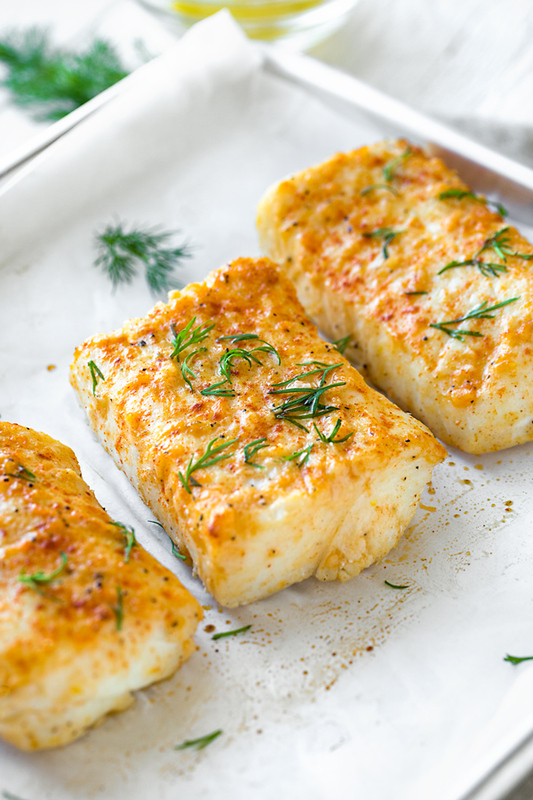 The temperature and cooking time for these halibut fillets is based on 6 ounces each, so if your cod fillets are the same, the cooking should be the same. If they’re bigger (more like 8 ounces), go a little longer on the cook time—maybe 12 minutes at 450°; and if smaller, go less.